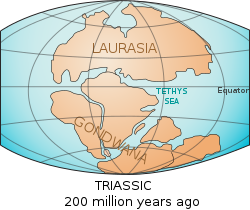 The Tethys Ocean splitting Laurasia from Gondwana. Dinosaurs evolved partway through the Triassic period of the Mesozoic era, around 230 Ma (million years ago). At that time, the earth had one supercontinental landmass, called Pangaea, of which Europe was a part. So it remained throughout the Triassic. By the start of the Jurassic period, some 30 million years later, the supercontinent began to split into Laurasia and Gondwana. The largest inlet from Panthalassa, the superocean that surrounded Pangaea, was called the Tethys Ocean, and as this inlet cut deeper into the supercontinent, much of Europe was flooded. By the Cretaceous, from 145 to 65 million years ago, the continents were beginning to approach their present shapes, but not their present positions, and Europe remained tropical. At times, it was a chain of island-microcontinents including Baltica and Iberia. Europe is relatively rich in fossils from the Jurassic-Cretaceous boundary, and much of what is known about European dinosaurs dates from this time. As the timeline below illustrates, there are substantial gaps in our knowledge from the rest of the Mesozoic. The absence of dinosaur genera from this time is because few fossils have been discovered, and almost certainly not because Europe contained few types of dinosaur—except, perhaps, immediately after the Triassic–Jurassic extinction event. This is a timeline of selected dinosaurs from the list above. Time is measured in Ma, megaannum, along the x-axis. Fossils of the creature must have been found in Europe. This list is a complement to Category:Dinosaurs of Europe. This page was last changed on 31 December 2018, at 18:16.